The red sea water is seen at a beach in Quang Binh Province, located in north-central Vietnam, on May 4, 2016. The seawater in a 1.5km stretch of a beach in Quang Binh, one of the four central Vietnamese provinces hit by a mysterious spate of fish deaths last month, has turned red on Wednesday morning. The reddish seawater was first spotted along the beach in Nhan Trach Commune at 7:30 am, and the color faded away by 11:00 am, according to local authorities. 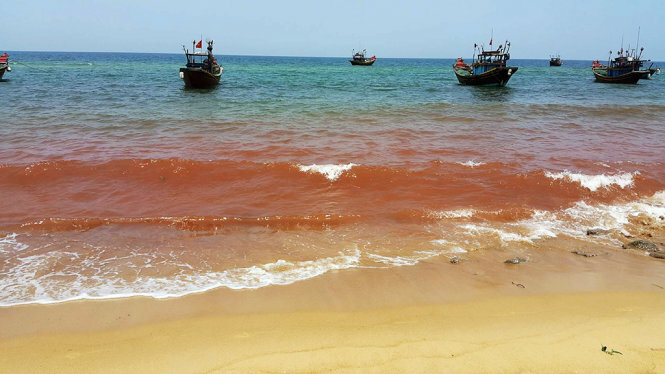 Phan Van Gon, secretary of the Party Committee of Bo Trach District, said he was inspecting the beach, following the mass fish deaths, when he saw the red seawater. A small amount of dead fish were seen washing ashore the Nhan Trach beach again on Tuesday and Wednesday, in the third such incident since the phenomenon began on April 6, Gon said. The official added that a delegate of officials from the Ministry of Natural Resources and Environment, accompanied by two experts from Japan and Israel, came to the beach around noon the same day to take seawater samples and dead fish specimen for tests. Local authorities are actively collecting the dead fish for destroying, Gon said.